Dr. Weinert earned his medical degree from the University of Utah School of Medicine and completed his residency training in physical medicine and rehabilitation at the Mayo Graduate School of Medicine in Rochester, Minnesota. 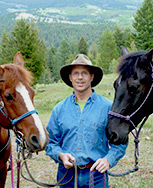 He has been in private practice in Helena since 1991 and joined the Helena Orthopaedic Clinic in 1998. Dr. Weinert performs neurodiagnostic testing and specializes in the diagnosis and nonsurgical treatment of neurologic and musculoskeletal disease and injury. He is a Fellow of the American Academy of Physical Medicine and Rehabilitation and a Diplomate of the American Board of Physical Medicine and Rehabilitation. Dr. Weinert is affiliated with St. Peter’s Hospital in Helena.